Angie Stone and Calvin Richardson's music is a lot about loving women and treating them right. Their hit duo "More than a Woman" will have you rocking and singing along. 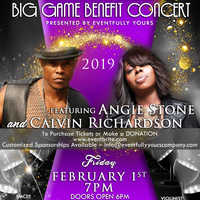 Whether you are visiting in town for the BIG GAME or local, this concert will enhance your week as you become a part of Angie Stone's world and the Calvin Richardson Experience for a night. Opening the evening will be Texas-born, Julliard-trained professional violinist Richmond Punch and the MC will be actress and author Chere' Turner. While enjoying a wonderful evening of music with two of the most talented artists in the industry today, you will be supporting an organization doing amazing work in the fight against domestic violence. The Still Standing Alliance nonprofit has been around for 7 years now and have proven themselves worthy of support. They were a part of the team that successfully got Marsy’s Law passed in Atlanta during the recent mid-term election. Marsy's Law for Georgia gives victims constitutional rights to be notified of judicial proceedings and bail or parole hearings, the right to be heard in court if they wish and the standing to seek a judicial remedy if their rights are not carried out. Part of the proceeds from this event will benefit the organization.